Locals and tourists alike agree—Beachcomber is the premier beach bar in San Diego, California. With drink specials and weekly events all year-round, you are sure to have an unforgettable time at our local bar. We are located along the beach so parking for cars is limited, but we have ample room for you to park and lock up your bicycle. From local craft brewers to high-end imports and wells to top shelf liquors, we have all the spirits you need to have a good time. Beachcomber is the destination for any sporting event, local or national. With more 15 television screen lining our location, your team is bound to turn up on one of our screens. We even show pay-per-view events, including the upcoming UFC™ bouts, so be sure to join us. Beachcomber is a proud sponsor of the OMBAC men's rugby club. To show our support, we host special events centered on the OMBAC club, so make sure to come and show you support the next time around. 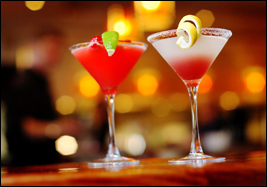 Contact our local bar to learn more about the drink specials we offer for each day.